Electronic Pedestrian Protection is a passive safety system. Engineers designed it to lower the intensity of injuries that occur to a pedestrian after striking a running vehicle. Every year, pedestrians are hit by a running vehicle. They form a major portion of people injuring in road accidents. It includes people walking on the road as well as bicyclists. Such cases are very common in the city areas congested with traffic. The injuries tend to be severe when the person's head strikes against the vehicle's bonnet, A-pillar or windscreen. Electronic Pedestrian Protection ensures to keep the intensity of such injuries to a minimum. Acceleration sensors, control unit, and an actuator mechanism are the main components of this system. The location of the acceleration sensors is in the front area of the vehicle inside the bumper. When pedestrian strikes against the front bumper, the acceleration sensor detects that motion (in terms of acceleration). It then sends the corresponding signal to the control unit. The control unit then orders the motor and the actuators to lift that end located below the upper end i.e. hinge of the bonnet. (See the diagram below). The lifting of the bonnet’s upper end protects the pedestrian is against the heat generated in the engine compartment. It also allows the bonnet to act as a cushion between the hard engine components and the pedestrian’s body. Manufacturers also make the car's structure suitable to absorb the energy of impact to the maximum extent. Thereby, it avoids injuries to the person. Volvo has extended this technology further by introducing the concept of pedestrian airbags. 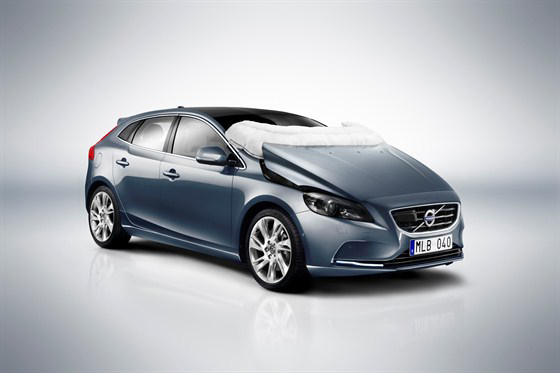 ‘Volvo V40’ is the first production vehicle in the world to exhibit this technology. This vehicle, in addition to the raising of the bonnet, also deploys an airbag. It covers the A-pillars, wipers and more than one-third portion of the windscreen. Thus, it provides an extra cushion to the pedestrian protecting him from the injury. Home » Technical Anatomy » How The Electronic Pedestrian Protection (EPP) System Saves From Injuries to Pedestrians?